As a teacher, I need to teach spellings; as for sending them home to learn, I have mixed feelings! As I am sure many parents do too! But like it or not, the new government agenda puts complex spellings as a high priority, so it is even more important to get into good habits early on. We have had that feeling when you suddenly twig its spelling test day and to your knowledge, the spellings haven’t been practised, possibly not even left the school bag. Please don’t beat yourselves up about it, any Child can learn words for a spelling test, but the real test is can they apply them in their writing! Instead, I am focusing on them taking home all those words they frequently spell wrong in their independent writing! These differ for all children and learning them will make a real difference. I have children in my class focusing on ‘when’, ‘with’, ‘found’, ‘suddenly’ etc . Every child in my class could tell an adult what spellings they need to learn and why, and that keeps it real. We also focus on a sound/phoneme or letter pattern, or spelling rule each week, and I would rather children grasped this rule, than practised a discrete set of spellings. 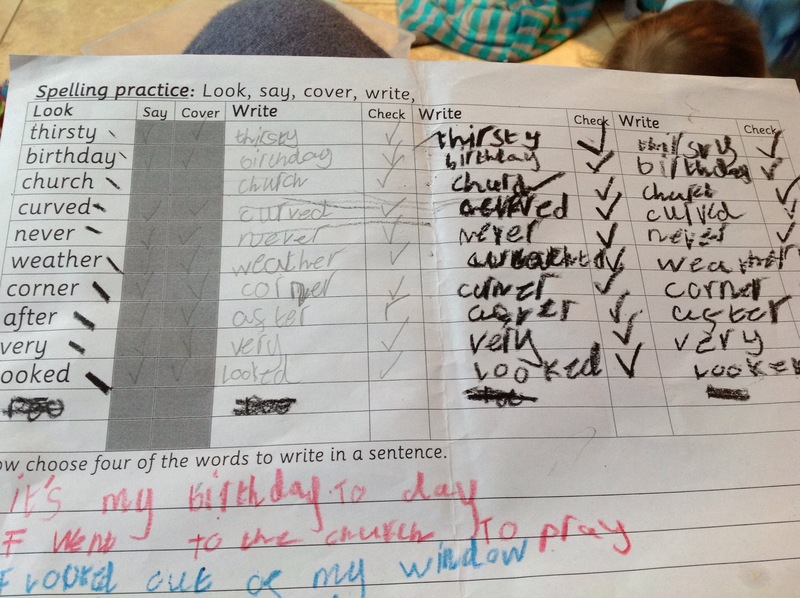 My daughter gets spellings every week (she is a year three now); finding time to practice as regularly as we would like was a nightmare initially (with us working full time) but now she can independently practise for some of the time! This has had a massive impact on her confidence, enthusiasm and success! We bought My spelling 2, and this has taken a lot of the pain out for us a family, and leaves my eldest to learn more independently. There are lots of apps like this, A++ spelling test is great, but wasn’t available, when we got my spelling 2. The children type the spelling, record it and practise, the kiddiewinks loves taking ownership, and eagerly put the words I, maybe worth checking they type them in correct initially, else you could find they are learning to spell words wrong- oops. The addition of anagrams, practices and tests, keeps it varied and since we started using it, her enthusiasm, confidence and results have improved. Another good way, is the tried and tested look, say, cover, write check sheet- just search in Google and there is lots of templates. Kiddiewink’s school have just started sending them out, so now we do a mixture of ipad and written. Spellings are no longer a chore in our house, and as she can practice independently for some of the time, and enjoys doing it; time is no longer an issue either. flash cards- these can be as simple as a piece of scrap paper with the word written boldly. Display them in lots of prominent places around the house. little rhymes and phrasing – eg there is a hen in when. Even better, is that younger siblings want to get in on the action and experiment with letters!